2007 Enshu EV450 CNC Vertical Machining Center s/n 402 w/ Fanuc Series 18i-MB Controls, 20-Station ATC, CAT-40 Taper Spindle, M-Code Indexer Interface, 10,000 RPM Spindle, Inline Direct Drive Spindle, Rigid Tapping, 18” x 31 ½” Table, Coolant. 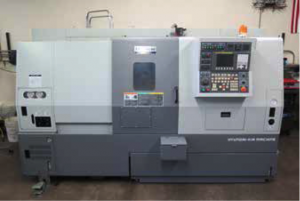 2006 YCM NSV102A CNC Vertical Machining Center s/n 0027 w/ Yeong Chin Fanuc MXP200i Controls, 30-Station ATC, CAT-40 Taper Spindle, 12,000 RPM, 30Hp Inline Direct Drive Spindle Motor, M-Code Indexer Interface, Spindle Air Blast and Coolant Blast, High Speed Contour Control, Hand Wheel, Rigid Tapping, Thread Milling, Chip Augers, Chip Conveyor, 25 ½” x 44” Table, Coolant. 2011 Hyundai – KIA Machine SKT15 LMS FOI-TC Twin Spindle, Live Turret CNC Turning Center s/n G3150-0196 w/ Fanuc Series 0i-TC Contr ols, Tool Presetter, 12-Station Live Turret, (4) Live Tooling, Front &amp; Rear Tooling Holders, 5000 Max Main Spindle RPM, 6000 Max Sub-Spindle RPM, 4000 Max Live Tooling RPM, 5 Deg Indexing Thru “B” &amp; “C” Axes, Parts Catcher, 7” 3-Jaw Main Power Chuck, 5” 3-Jaw Sub Power Chuck, Royal 3J Collet Noses For Main and Sub Spindles, Coolant. 2008 Takisawa NEX-106 CNC Turning Center s/n CII0N60047 w/ Takisawa- TURNi- Fanuc Controls, 12- Station Turret, Hydraulic Tailstock, 5000 Max RPM, Chip Conveyor, 7” 3-Jaw Power Chuck, 3J Collet Nose, Coolant. Bridgeport Vertical Mill s/n 168400 w/ Acu-Rite III DRO, 1Hp Motor, 80-2720 RPM, Chrome Ways, 9” x42” Table. Tsugami mdl. T-SPL Hand Chucker s/n 4002 w/ 125-3000 RPM, Threading Attachment, 8-Station Turret, Power Feeds, 5C Collet Closer, 6” 3-Jaw Chuck. Hauser mdl. 28A Jig Boring Machine s/n 83 w/ 3000 Max RPM, 12” x 17 ¾” Table. Harig “Super-612” 6” x 12” Automatic Hydraulic Surface Grinder w/ Magnetic Chuck. (2) Professional Finishing mdl. 300WT Media Tumblers w/ 12” x 35” Tub, Fluid Pump. Polyrock mdl. 36 S.B. Heavy Duty Dry Blast Cabinet s/n 9829858 w/ 15-Sock Element Dust Collector. Curtis mdl. 10VT12 10Hp Vertical Air Compressor w/ 120 Gallon Tank. Haas 4 th Axis 5C Rotary Indexer w/ Haas Servo Controller. (4) Kurt 6” Angle-Lock Vises and (4) Kurt 4” Double-Lock Vises. Suburban mdl. MG-5CV- S1 Precision 5C Grinding Fixture. 5C Indexing Head and Pneumatic Collet Closers. Huot Drill Cabinet w/ Drills. Insert Milling, Turning and Boring Tooling, Carbide and HS Endmills, Drills, Taps and Reamers. L & R mdl. 2014B Ultrasonic Cleaning Tank.